Roosevelt engineers Nick Ahrens (left) and Tony Bugajsky. In a humid and oppressive August evening in Chicago, some 20 tourists from around the world gathered around tour guide Andy for his weekly “ghost walk” around the South Loop. At the Congress Hotel –considered one of the most haunted places in the city — we learn about Karel Langer, a young boy tossed out of a 12th floor hotel window in 1939, whose ghost is legendary. And we were told about Shadow Man, who killed himself the night before his wedding in 1900, and reportedly still occasionally roams the lobby, where the piano sometimes . . . plays by itself. But what about the Auditorium Building and Theatre, just across the street? 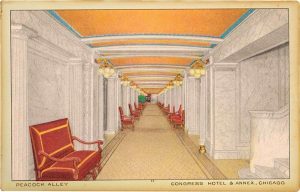 The ghost tour speculates about a “presence” felt near Peacock Alley, the underground marble tunnel linking the Congress and Auditorium hotels at the turn of the century that was walled up in 1911. Is the Auditorium Building, opened in 1889 as a stately hotel and world famous Theatre and now home to Roosevelt University, haunted? To find out, we asked staff members who work the night shift and Roosevelt alumni. The Theatre is a magnificent space with 4,200 seats, four balconies, a deep stage and an ornate lobby. The after-hours lighting is dim and the space cavernous and full of shadows and dark corners. 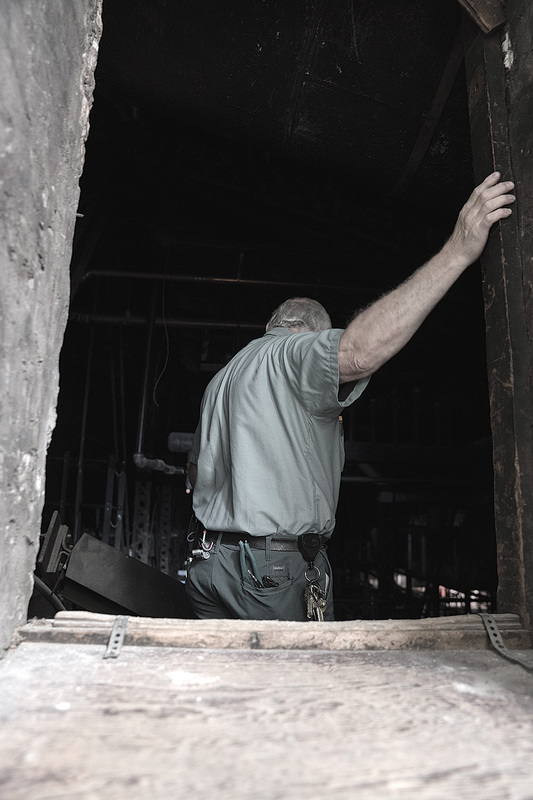 Nick Ahrens, an engineer whose job includes checking the fire safety mechanisms at night, reports experiencing numerous episodes of a “presence” in the Theatre. These include muffled conversations and laughter, mysterious footsteps and doors banging shut when no one is there. The Theatre has also startled campus safety officer Clara Christmas, who reported that while working the midnight shift some 10 years ago, “I thought I heard voices in the Theatre – as if there were a performance at two in the morning.” But the stage was empty and after that time “I changed my mind about visiting certain places at night!” she said. Engineer Tony Bugajsky walks high above the Theatre stage. But some former students recall noticing a presence in the Theatre. One remembered sneaking into the fourth balcony at night with some friends and suddenly confronting a man in Victorian clothing who shook his finger at them. The students scrambled rapidly out of the balcony but on looking back over their shoulders saw . . . nothing. Gilmore reported that a “cleanser” was hired to speak to the spirits and encourage them to leave. No sightings of Native American ghosts have been reported since. 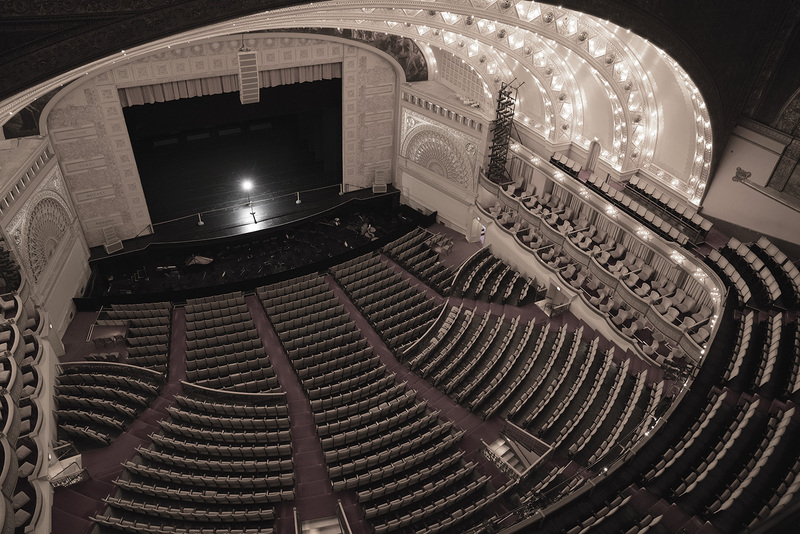 The Auditorium Theatre and its balconies have been the site of numerous ghost encounters. The Auditorium Building was once home to 400 hotel rooms, business office suites, large reception halls and a tower that rises 10 floors above the building and contains a maze of stairwells, narrow corridors and small offices. Full of students, faculty and staff during the day, late at night the Auditorium Building is silent, dark and lonely. The architects and designers of the building, Dankmar Adler, Louis Sullivan and their apprentice Frank Lloyd Wright, occupied offices on the 17th floor of the tower. Alumna Caitlin Spratt recalled students who would wander around the building at night sometimes heard faint conversations in and near the tower. “Legend has it that if you walked by the elevator entrance to the tower, or inside the tower itself, the noises people heard were actually the arguing and fighting of Adler and Sullivan,” she said. The Congress Lounge and other spaces on the second floor of the Auditorium Building also reportedly are the site of ghostly presences. Engineer Tony Bugajsky said that while doing night rounds on the Congress corridor of the second floor he has heard muffled conversations and twice has felt something touch his finger. “I took my flashlight and saw nothing,” he said. 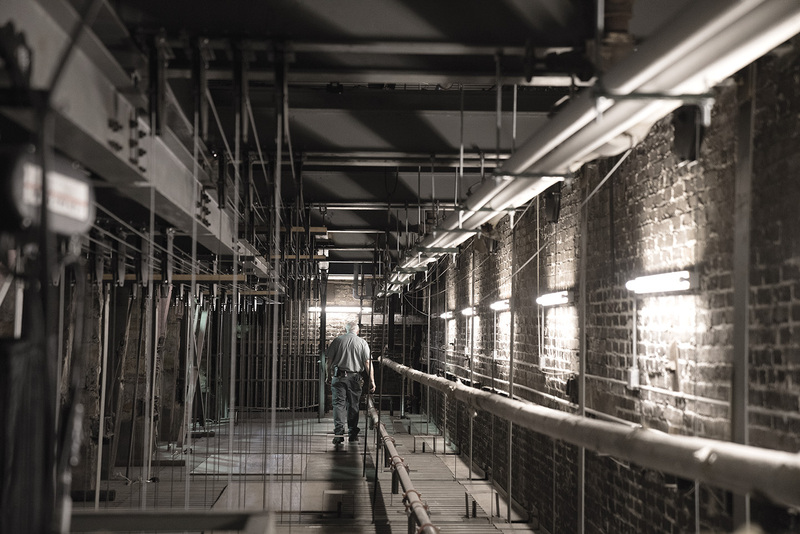 He has heard loud running steps behind him on the south side corridor of the eighth floor, lockers slamming in the basement office at five in the morning when no one else was in the room and banging noises on the south side of the sixth floor. The Academic Success Center is housed just to the south of the Michigan Avenue lobby. Assistant Director Danielle Smith reported that she was alone in the office early one morning when she put her water bottle on a sink, suddenly felt very cold, and “Bang! My water bottle flew off the sink and into the wall, I was shaken up for hours!” She also said a student told her the story of working in the 10th floor library late at night and suddenly he saw a maid start to clean the tables. The thing was – the maid was wearing “an old timey outfit” and missing her legs. There is one room in the Auditorium Building with an especially eerie history. Generations of students have heard about the eccentric and world-renowned actress Sarah Bernhardt, who performed on the Auditorium stage from the 1890s to the early 20th century. She always stayed in Room 720 and slept in a coffin. This story is probably true as Bernhardt, in fact, had a coffin built for travel so she could sleep in it while on tour and “better understand her tragic roles.” The coffin was lined with white satin and replete with flowers and letters from her many lovers. She also traveled with her huge Saint Bernard dog and two maids. The history and philosophy students who now use this room for seminars haven’t reported any canine or human ghostly presence during their classes . . . yet. The ninth floor – originally the home of the Chicago Musical College and now housing the Chicago College of Performing Arts – seems to be another popular site for spectral occurrences. 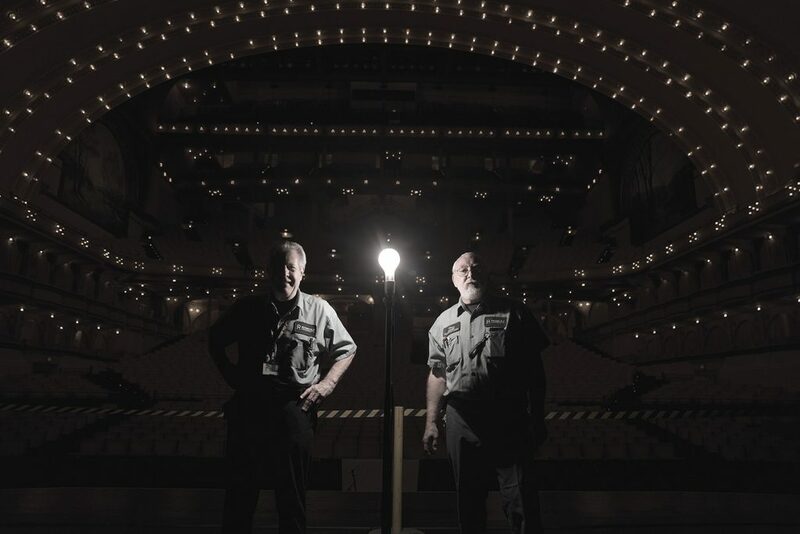 So – is the Auditorium Building haunted? 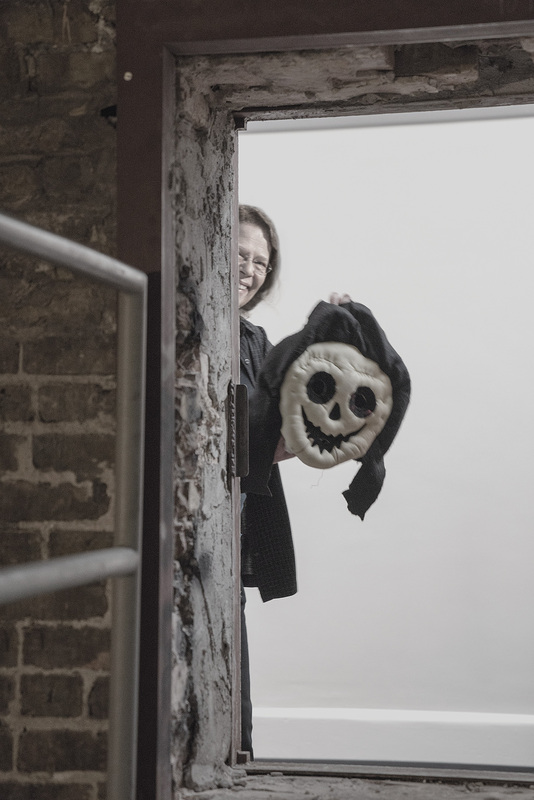 University Historian Lynn Weiner uses a prop to entice ghosts hiding in the Auditorium Building. In addition, Smith stated that once a presence is sensed, an individual’s cultural expectations and past experiences can create such hallucinations as mysterious footsteps, a tap on the shoulder, dimly heard conversations, or sightings of angels, UFOs, ghosts, or otherworldly beings. There can also be a group effect where several people simultaneously experience the same hallucination. 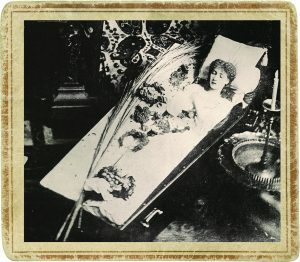 Actress Sarah Bernhardt posing in her traveling coffin. 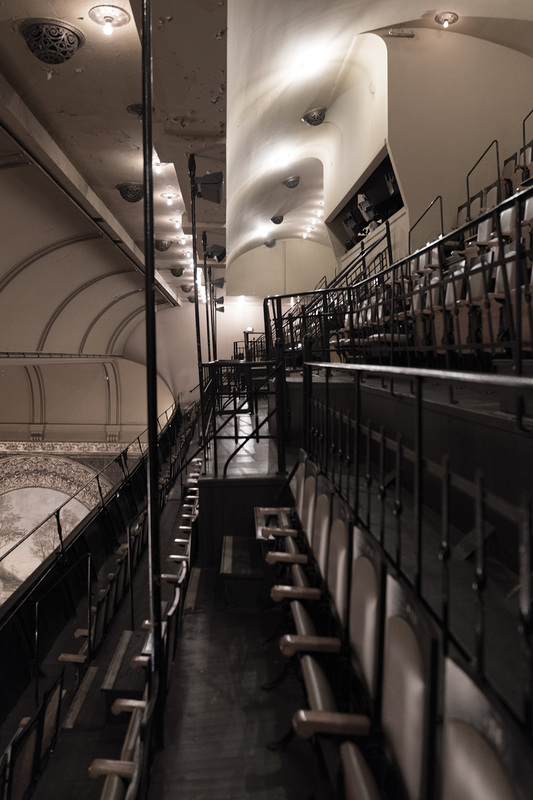 Author Italo Calvino wrote, “The more enlightened our houses are, the more their walls ooze ghosts.” Well, the Auditorium Building and Theatre are certainly enlightened places that exist in the larger world of wonder. Do ghosts visit our buildings at night? Just ask the night shift. Hi there, I enjoyed this article and find it interesting. I also have a thing or two to share relating to this. Several years back, I had worked for a temp agency that assigned me to work there. I was doing janitorial duties on weekends before, during, and after shows. At night after the show, there were places in that theater that would creep me out. Such as the upper balconies, some bathrooms, and the older dressing rooms.Those areas gave me chills.I often heard voices and saw things in the corner of my eye. When I turned to look and see……nothing. There is definitely a presence there. So with that said, Thank you for writing this article. I know I’m not the only one who thinks it’s haunted.